Gethsemane! That is the place where we are going through now. What is Gethsemane in the realm of the spirit? It is the place of temptations, tribulations and sorrows, the place of betrayal, the place of distress and trouble, the place of agony, sweat and blood. It is a time of spiritual wilderness loaded with terrible temptations. A time comes in spiritual warfare when you have to go through your own personal Gethsemane. That is when your desired breakthrough seems delayed for no reason and you begin to wonder what next to do after all you have done. You feel vulnerable and wonder why God was silent and if God is still on your side. Your closest friends seem to abandon you not because they wanted to, but because they were overwhelmed by their own personal problems. You are alone, alone with God and, with satan, the tempter, supervising your trials. When I said temptations, I mean that is the time you may be tempted to doubt if God would come through for you. What you do or say at those trying times determines if you will come out triumphant or not. Even when things appear to be working against you, do not confess negative, that is why the Bible admonished us in Ecclesiastes 5:6: “Suffer not thy mouth to cause thy flesh to sin; neither say thou before the angel, that it was an error: wherefore should God be angry at thy voice, and destroy the work of thine hands?” Everybody will face their own test of faith, no escape! Be careful what you say now, do not say before the angel bringing your blessings that it is an error. Matthew 26:40-41: He said to Peter, “…Couldn’t you watch with me even one hour? Watch and pray so that you will not fall into temptation. The spirit is willing, but the body is weak”. I pray: Every power that wants to wear out your patience and wants to push you into doubt about the surpassing ability of God over your case, I command that power to DIE NOW!!! Reject every contrary voice speaking doubt to your miracle, whispering failure to what God has already accomplished for you. I want to congratulate you for this season of the death and resurrection of our Lord Jesus. Hear me: There are things you need to drag to the Cross and nail to the Cross this season, the many adversities confronting your destiny. To do that you must have fire in your belly. I would by the enabling grace of God, be leading you to raise an altar of fire this season, that is the place where you must drag all your ‘confronters’. May I ask you where is your fire??? Please get ready to ignite an altar of fire that will consume every challenge or delay to your godly desires, He died that you have those things FREELY, the only price you pay is the price of connecting with God. So, let’s prepare that fire now and get ready to uproot every of your buried blessing by the power of resurrection that is coming upon you afresh this season. See u at the altar of fire in the next 24 hours!!! 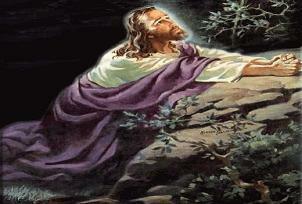 Power to prevail at the place of my Gethsemane, fall upon me now, in the name of Jesus. Arrows of unbelief fired against my destiny at the edge of my breakthrough, gather yourselves together, GO BACK TO YOUR SENDER!!! in the name of Jesus. Every arrow fired to weaken my body and my spirit-man at the altar of prayer, you are a liar! BACK FIRE!!! in the name of Jesus. It is written (Romans 8:32): “He who did not spare his own Son, but gave him up for us all–how will he not also, along with him, graciously give us all things?” Therefore, everything that Jesus my Lord died for to make me free and partake of all blessings, BEGIN TO MANIFEST IN MY LIFE NOW!!! in the name of Jesus. Every satanic assignment programmed to distract and overwhelm my divine helpers at my hour of need, S-C-A-T-T-E-R UNTO DESOLATION!!! in the name of Jesus. Every demonic trial programmed to weary my faith in the finished works of Christ Jesus, ROAST!!! in the name of Jesus. Every cup of failure designed to make me stagger out of the will of God for my life, BREAK TO IRREPARABLE PIECES!!! in the name of Jesus. Every rod of wickedness targeting to smite the shepherd ministry over me, B-R-E-A-K TO PIECES!!! in the name of Jesus. Arrow of deep slumber fired to make me fail at the altar of prayer, Die! Die!! Die!!! in the name of Jesus. Every adversity confronting and challenging my destiny, I DRAG you to the Cross of Calvary, BE DISGRACED!!! in the name of Jesus. It is written (1 Corinthians 10:13): “There hath no temptation taken you but such as is common to man: but God is faithful, who will not suffer you to be tempted above that ye are able; but will with the temptation also make a way to escape, that ye may be able to bear it.” Therefore O God arise and deliver me from every temptation that is too much for me! in the name of Jesus. Every temptation that wants to drag me to hell fire, I cut-off your chains with the sword of Fire! in Jesus’ name. Every siege over my prayer life by dark raiders of virtues, PERISH BY FIRE!!! in the name of Jesus. (This next prayer is a practical prayer of faith. If our Lord Jesus went on His knees in prayer at Gethsemane, let us lie prostrate on the floor of our prayer altar as we take this next one). Every boasting power pointing the finger of wickedness against my destiny (you can put ‘my marriage’, ‘my career’, ‘my ministry’, etc in the space), as I lie prostrate before God this hour, I command you to surrender, somersault and die!!! in the name of Jesus. Arrow of sorrow, assigned to bow me out from praying and fellowship of God, what are you waiting for? DIE!!! in the name of Jesus. Every false accusation carefully prepared against me to derail my destiny, hear the word of the Lord: GO BACK AND FALL UPON THE HEAD OF YOUR SENDERS!!! in the name of Jesus. Envious powers secretly planning to snare and to smear my glorious testimonies, BE OPENLY DISGRACED BY FIRE!!! in the name of Jesus. Gate of delay assigned to hinder my godly desires (you can mention what that desires are in this space), BE UPROOTED BY Fire and Cast into the bottomless pit!!! in the name of Jesus. Every whisper of doubts and failure over my heart, I SHUT YOU DOWN, BE SILENCED PERMANENTLY!!! in the name of Jesus. O Lord my God, help me to repair my broken-down prayer altar that fresh fire may fall again upon life for Your service, in the name of Jesus. Every agenda programmed to kill the plan of God for my life, CATCH FIRE and BURN TO ASHES!!! in the name of Jesus. 6 Comments on "See You At Gethsemane!!!" pray for me. Am praying for fruit of the womb. Please pray with me, our program is winding up this June and i need a job. On 29th March I received a phone call asking me if I was interested in being a Deputy Chief of Party Operations for a very big organization. I agreed and the lady sent me the job description. Upon submission of my CV the employers changed the educational qualifications from Bachelors Degree to a Masters. The night before I was told about the organization’s change of mind, i dreamt about my elder sister and her husband who are both into witchcraft. They were scratching my daughter’s sculp as though removing dandruf. I later dreamt of my young sister who is now late going insane. When I woke up, I prayed and cancelled the dreams. I later called the lady who asked for my CV and she told me that the organization wants someone with a masters degree and would consider my CV because it is very strong if I have a masters degree. I dont have a masters degree, i can perform better than people with masters degrees. Please pray with me for God to open new doors. I wish to thank the Almighty God for this website. May God richly bless you for introducing it. I’m really grateful for it, whenever I need to be encouraged or need to pray, I open it and I’m motivated. I appreciate God for it, once more may God increase you more. Kindly stand with me in prayer that there should be progress in our life me and my family. Going round in circles, stagnation and procrastination should come to an end as well as being on the same mountain to be destroyed and move forward and upward only. God to do new and better things in our lives. Continue doing the might work of God, amen!! !